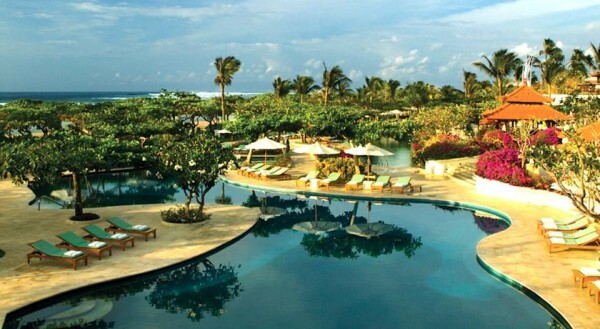 If you’re hunting for an exotic Asian beach resort, then head to Bali in Indonesia. Tagged as one of the best in the business among many other resorts, Grand Hyatt is surely a tripper of an experience. The management certainly deserves the credit for putting Bali on top of tourism maps globally. Facilities given here are authentic and truly admirable and the stay worth every penny spent. Grand Hyatt is moderately built and not the biggest of all the resorts. It spreads over several acres of land comprising of spas, neatly maintained exquisite lawns, Balinese village, craftsmen, culture shows and last but not the least Indonesian delicacies. Quality is at par when compared to some exotic resorts. The resort sticks to the Indonesian culture while intelligently camouflaging into a modern hotel at all times. Activities are aplenty to be experienced. Undergoing renovation some time back, the resort hasn’t changed much, but polished pretty well. It takes a pleasure for any resort to announce 650 accommodations available to cater any number of tourists knocking its doors. The accommodations comprise of suites and villas and most of these have private balconies and gardens. The amenities and facilities provided are of top quality, and the management has indeed worked hard in giving utmost customer satisfaction, luxury, convenience and comfort. The Customer Care Department here probably has to work the least, as there’s not much to complain as attention paid to smallest details is quite remarkable. Whether you intend to travel with friends or family, Grand Hyatt welcomes one and all. Moreover, children would have the time of their life with plenty of programs arranged specially for them.